All cattle and calves came out at 97.102 million head or 102% of a year ago. Analysts had been expecting 101% to 101.5%, with an average guess of 101%. Total cows were at 42.311 million head, up 1% from a year ago, in line with estimates. Beef and milk cows came out at 101%, as expected. Important part for me there is total cows are up 1% from last year. It's not surprising since with the high cattle prices producers are keeping back more heifers to grow their herds to take advantage of the prices. The real trick is to realize when prices are likely to start going down because of overproduction. I don't see that for at least a couple of years yet so I like everybody else, is trying to expand their herds. Boom or bust cycle. Ride the high of the boom and hope you survive the bust. A little hint, proper planning keeps the bust from hurting you, you don't have to hope, you've got things well in hand and make your moves to take advantage of the situation. That's the key, not hope, planning. 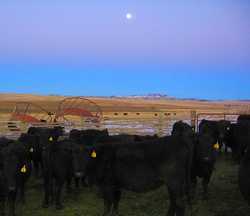 Some of the heifers that have yet to calve lounging around in the evening with the moon coming up behind them. The colors were interesting to me. Taken 2/11/2006.